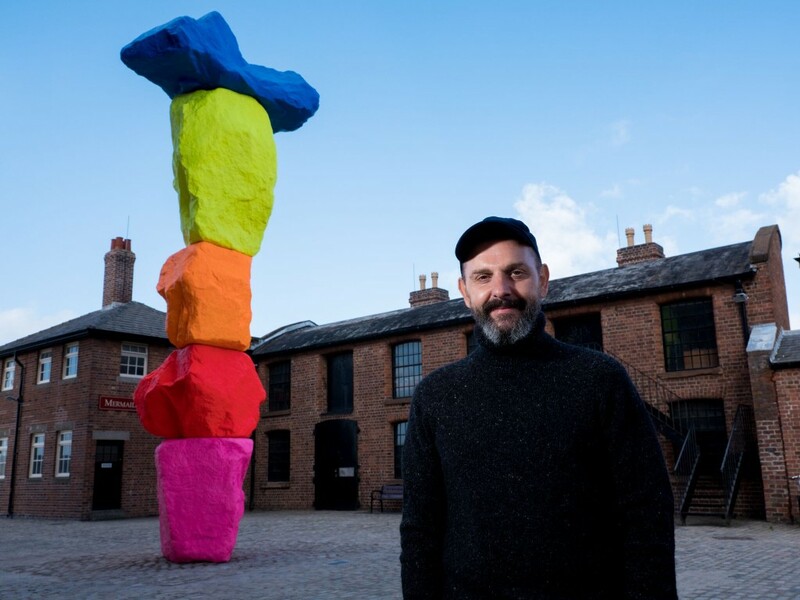 Internationally acclaimed artist Ugo Rondinone unveiled a new public sculpture today (23 October) at Liverpool’s Royal Albert Dock. ‘Liverpool Mountain’ is the first artwork of its kind in Europe and is part of the Liverpool 2018 programme. Ugo has collaborated with Liverpool Biennial and Tate Liverpool to bring his latest colourful piece to the city. It marks the 10th anniversary of Liverpool’s European Capital of Culture status, as well as the 20th anniversary of Liverpool Biennial and 30 years since Tate Liverpool opened at the dock. The towering sculpture, which is situated in Mermaid Courtyard, is 10 metres tall and has been built using the ‘hoodoo’ rock formation, inspired by the art of meditative rock balancing. ‘Liverpool Mountain’ forms part of Ugo’s mountain series, mirroring his works in Las Vegas and Miami, and celebrates Liverpool’s drive of supporting bold and current art. Artist Ugo Rondinone with ‘Liverpool Mountain’. Image by Mark McNulty. Switzerland-born Ugo was also in attendance at the event, and described his creation as an “artwork of thresholds and crossings, inclusion and gatherings”. He went on to say: “It evokes contradiction and solidarities between the artificial and natural, the human and nature”. Addressing dock visitors who had gathered to see ‘Liverpool Mountain’ in place for the first time, Ugo added: “To the people of Liverpool who are here to celebrate, I am over the moon.